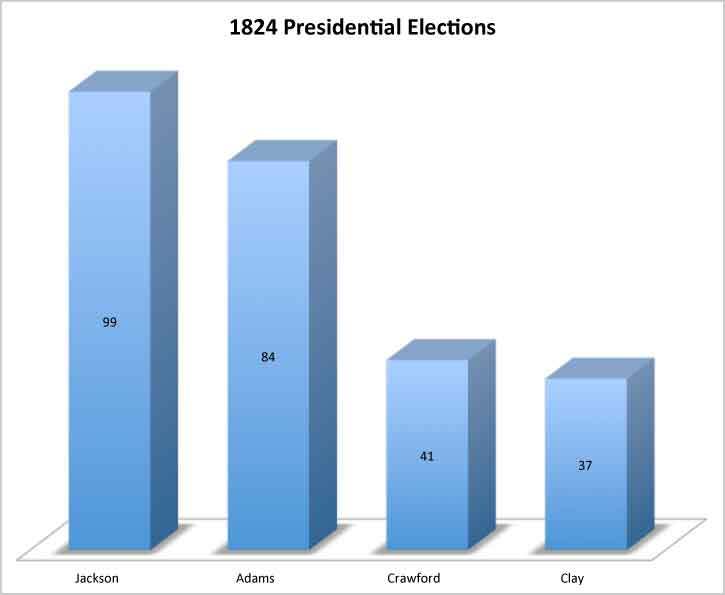 The campaign to succeed Monroe as President began early, with many different candidates being suggested. It soon came down to four viable candidates. William Crawford, Secretary of Treasury, John Q. Adams, Henry Clay and General Andrew Jackson. Crawford was the first to be an official candidate, being selected by caucus of Republican Congressmen. Being selected by a caucus actually hurt Crawford's chances, when he became identified with a system of selection that was out of favor. Each of those nominated represented a different geographic part of the country. As had become common in Presidential campaigns, the newspapers of the time wrote very favorable items about those they supported. Conversely, newspapers attacked those they opposed with venom. They made fun of how poorly Adams dressed and his "English" wife. They called Clay “a drunkard and gambler”. They charged that Crawford had done unlawful acts while in office, and accused Jackson of murder. It became clear that no candidate received the majority of either the popular vote or the electoral vote. 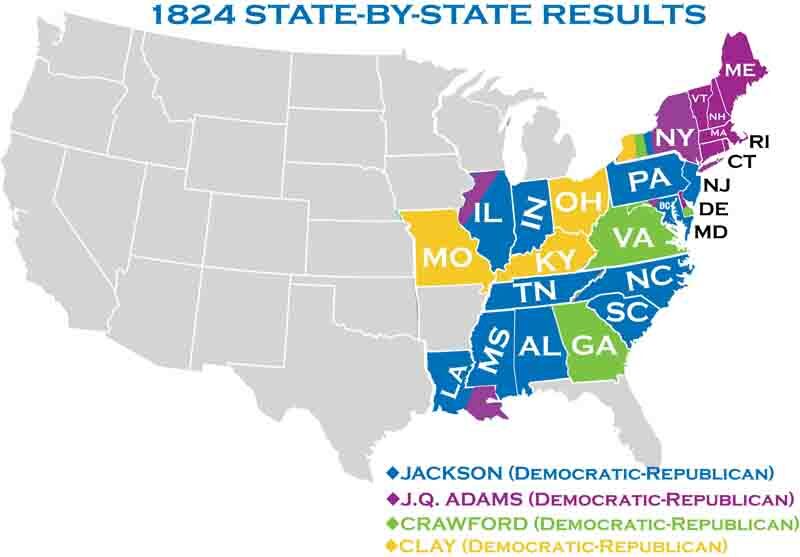 Though Andrew Jackson was in the clear lead, with 99 electoral votes and 152,901 popular votes. 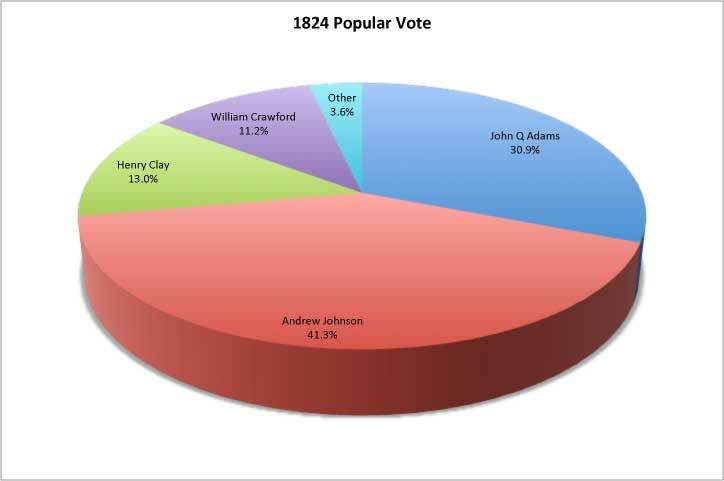 Adams had 84 electoral votes and 11,023 popular votes. Crawford was a poor third, and Clay brought up the rear. As no candidate received 50% of the electoral votes, under the provisions of twelfth amendment to the constitution, the House voted for the President. Each state had one vote and only the top three vote recipients participated. Clay who came in fourth could not compete. Clay believed that Adams was the best qualified to be President. He did not believe that Jackson's success as a general meant he was ready for the Presidency and thus supported Adams. Adams laters selected Clay to be his Secretary of State thus opening the way for charges that it was a "corrupt bargain."